The last of the five services held on the Day of Atonement. 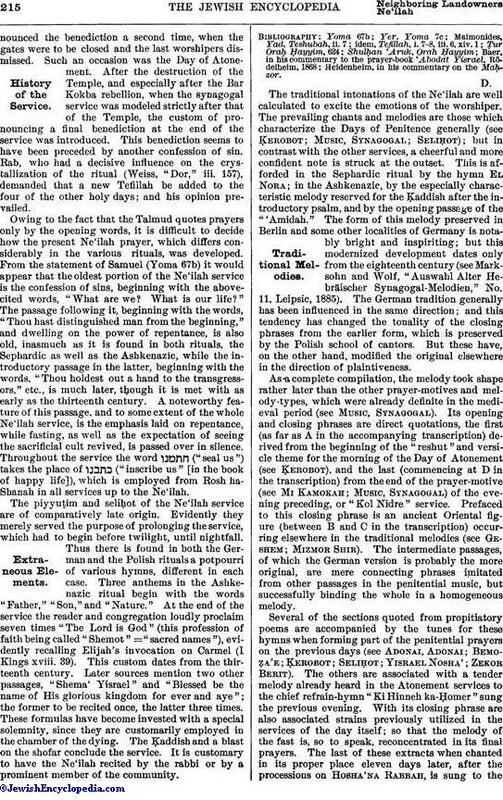 The earliest mention of it is in the Mishnah (Ta'an. 26a), where it is said: "On three occasions the priests pronounce the benediction four times in the day, namely, at the morning, special [Musaf], and afternoon sacrifices and at the closing of the gates" ("Ne'ilat She'arim"). These three occasions are the Day of Atonement, other fast-days, and the days of "ma'amad" (local celebrations held in the country towns simultaneously with offerings brought in the Temple by delegates from them; see Priesthood). A baraita of unknown origin, but probably not older than the first half of the third century, mentions the five services of the Day of Atonement, beginning with the services held on the eve of the day and closing with Ne'ilah (Pes. 3a), which is here not called "Ne'ilat She'arim" as in the Mishnah. In the third century the principle of this prayer was still a subject of controversy between Rab (Abba Arika), on one side, and Samuel and R. Johanan, on the other. Rab demanded that Ne'ilah should be a special service, while Samuel considered the recitation of the formula of self-humiliation, "What are we? What is our life?" etc. (still found in the ritual), as sufficient. Another discussion arose, on the meaning of the word itself. R. Johanan held that "Ne'ilah" meant the closing of the gates of the Temple, while Abba claimed that it meant the closing of the gates of heaven (Yer. Ta'an. 7c). Both the Sephardic and the Ashkenazic rituals express the latter idea in their anthems; the Ashkenazic saying: "Open for us the gate at the time of the closing of the gates," and the Sephardic still more clearly: "At the time of the closing of the heavenly gates forgive our iniquities." It would seem that R. Johanan's interpretation is correct. In the Temple at Jerusalem the priests pronounced the benediction at every sacrificial service. On especially solemn occasions they pronouncedthe benediction a second time, when the gates were to be closed and the last worshipers dismissed. Such an occasion was the Day of Atonement. After the destruction of the Temple, and especially after the Bar Kokba rebellion, when the synagogal service was modeled strictly after that of the Temple, the custom of pronouncing a final benediction at the end of the service was introduced. This benediction seems to have been preceded by another confession of sin. Rab, who had a decisive influence on the crystallization of the ritual (Weiss, "Dor," iii. 157), demanded that a new Tefillah be added to the four of the other holy days; and his opinion prevailed. Owing to the fact that the Talmud quotes prayers only by the opening words, it is difficult to decide how the present Ne'ilah prayer, which differs considerably in the various rituals, was developed. From the statement of Samuel (Yoma 67b) it would appear that the oldest portion of the Ne'ilah service is the confession of sins, beginning with the above-cited words, "What are we? What is our life?" The passage following it, beginning with the words, "Thou hast distinguished man from the beginning," and dwelling on the power of repentance, is also old, inasmuch as it is found in both rituals, the Sephardic as well as the Ashkenazic, while the introductory passage in the latter, beginning with the words, "Thou holdest out a hand to the transgressors," etc., is much later, though it is met with as early as the thirteenth century. A noteworthy feature of this passage, and to some extent of the whole Ne'ilah service, is the emphasis laid on repentance, while fasting, as well as the expectation of seeing the sacrificial cult revived, is passed over in silence. Throughout the service the word ("seal us") takes the place of ("inscribe us" [in the book of happy life]), which is employed from Rosh haShanah in all services up to the Ne'ilah. The piyyuṭim and seliḥot of the Ne'ilah service are of comparatively late origin. Evidently they merely served the purpose of prolonging the service, which had to begin before twilight, until nightfall. Thus there is found in both the German and the Polish rituals a potpourri of various hymns, different in each case. Three anthems in the Ashkenazic ritual begin with the words "Father," "Son," and "Nature." At the end of the service the reader and congregation loudly proclaim seven times "The Lord is God" (this profession of faith being called "Shemot" = "sacred names"), evidently recalling Elijah's invocation on Carmel (I Kings xviii. 39). This custom dates from the thirteenth century. Later sources mention two other passages, "Shema' Yisrael" and "Blessed be the name of His glorious kingdom for ever and aye"; the former to be recited once, the latter three times. These formulas have become invested with a special solemnity, since they are customarily employed in the chamber of the dying. The Ḳaddish and a blast on the shofar conclude the service. It is customary to have the Ne'ilah recited by the rabbi or by a prominent member of the community. Heidenheim, in his commentary on the Maḥzor. The traditional intonations of the Ne'ilah are well calculated to excite the emotions of the worshiper. 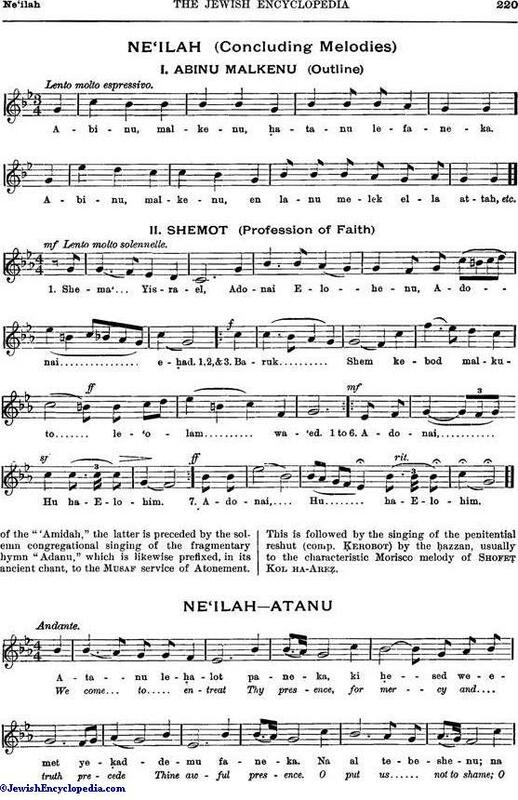 The prevailing chants and melodies are those which characterize the Days of Penitence generally (see Ḳerobot; Music, Synagogal; Seliḥot); but in contrast with the other services, a cheerful and more confident note is struck at the outset. 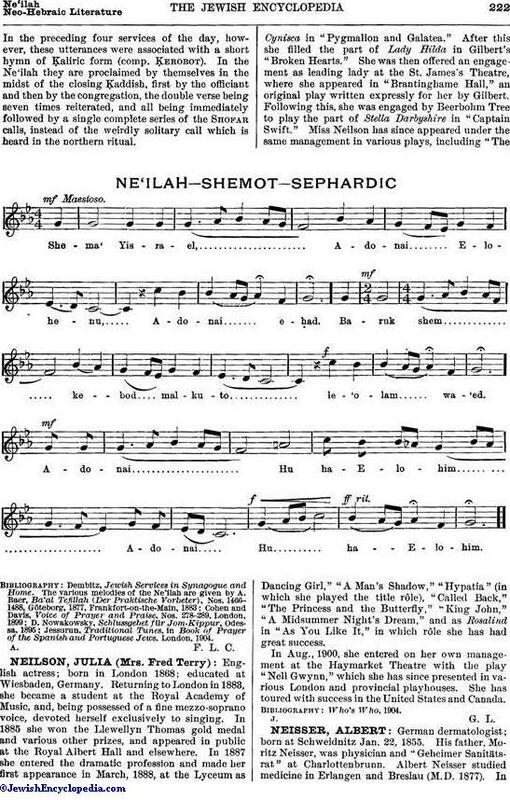 This is afforded in the Sephardic ritual by the hymn El Nora; in the Ashkenazic, by the especially characteristic melody reserved for the Ḳaddish after the introductory psalm, and by the opening passage of the "'Amidah." 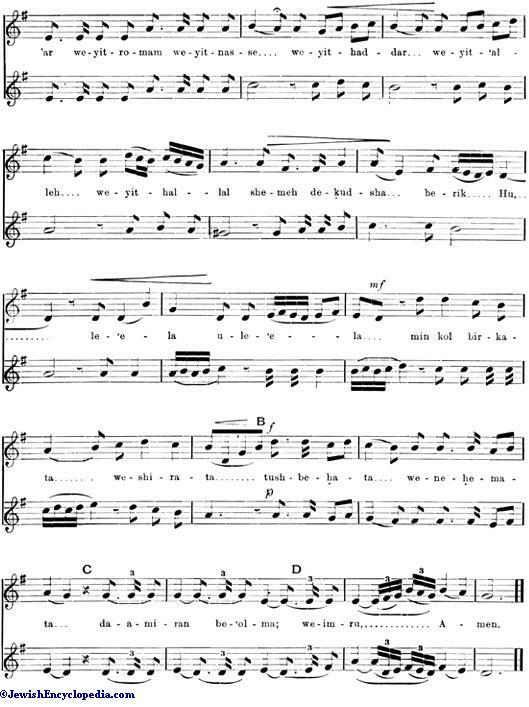 The form of this melody preserved in Berlin and some other localities of Germany is notably bright and inspiriting; but this modernized development dates only from the eighteenth century (see Marksohn and Wolf, "Auswahl Alter Hebräischer Synagogal-Melodien," No. 11, Leipsic, 1885). 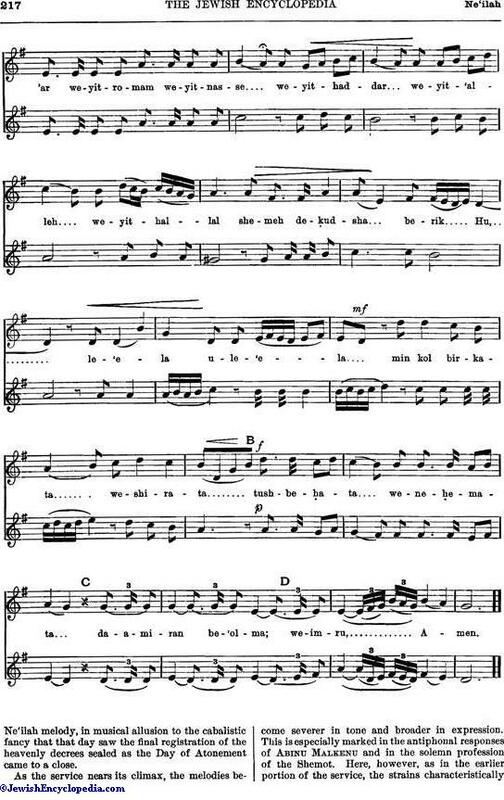 The German tradition generally has been influenced in the same direction; and this tendency has changed the tonality of the closing phrases from the earlier form, which is preserved by the Polish school of cantors. But these have, on the other hand, modified the original elsewhere in the direction of plaintiveness. 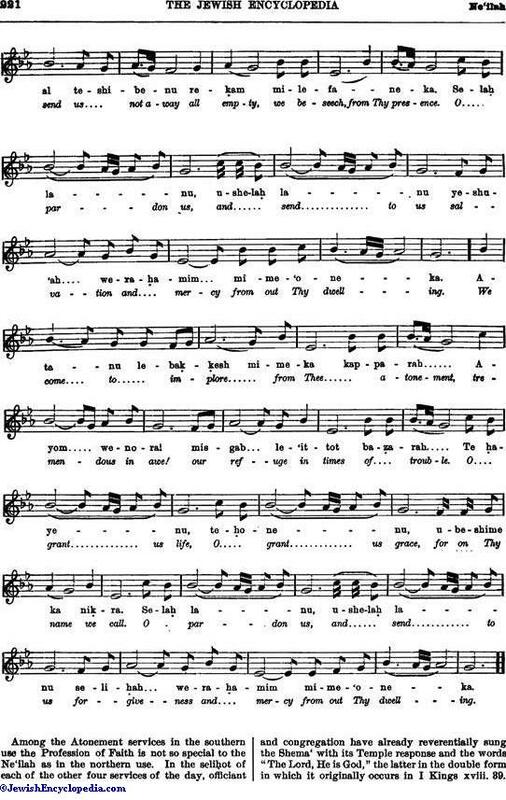 As a complete compilation, the melody took shape rather later than the other prayer-motives and melody-types, which were already definite in the medieval period (see Music, Synagogal). 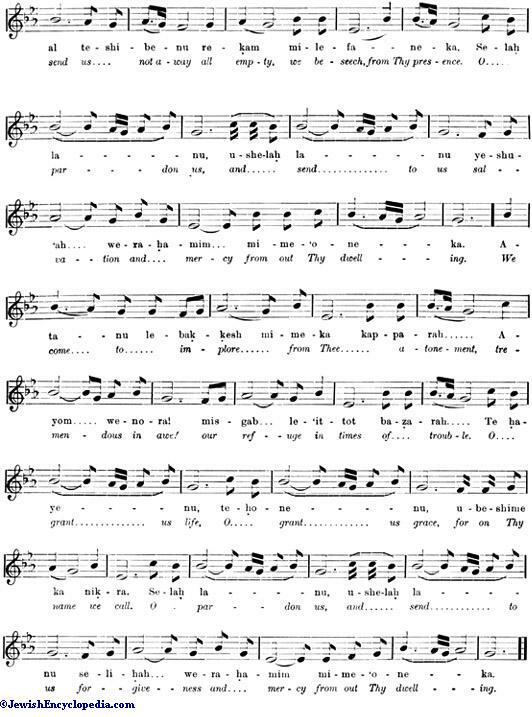 Its opening and closing phrases are direct quotations, the first (as far as A in the accompanying transcription) derived from the beginning of the "reshut" and versicle theme for the morning of the Day of Atonement (see Ḳerobot), and the last (commencing at D in the transcription) from the end of the prayer-motive (see Mi Kamokah; Music, Synagogal) of the evening preceding, or "Kol Nidre" service. 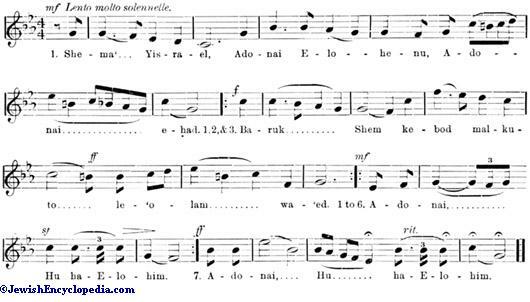 Prefaced to this closing phrase is an ancient Oriental figure (between B and C in the transcription) occurring elsewhere in the traditional melodies (see Geshem; Mizmor Shir). 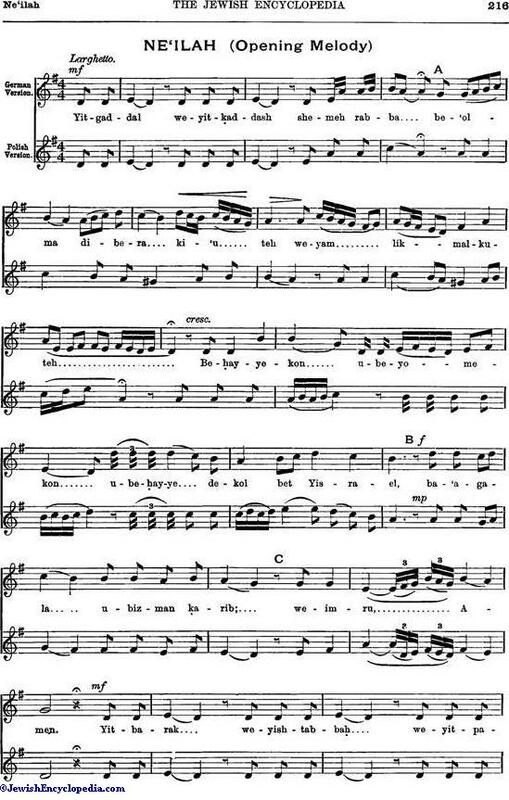 The intermediate passages, of which the German version is probably the more original, are mere connecting phrases imitated from other passages in the penitential music, but successfully binding the whole in a homogeneous melody. Several of the sections quoted from propitiatory poems are accompanied by the tunes for these hymns when forming part of the penitential prayers on the previous days (see Adonai, Adonai; Bemoẓa'e; Ḳerobot; Seliḥot; Yisrael Nosha'; Zekor Berit). The others are associated with a tender melody already heard in the Atonement services to the chief refrain-hymn "Ki Hinneh ka-Ḥomer" sung the previous evening. With its closing phrase are also associated strains previously utilized in the services of the day itself; so that the melody of the fast is, so to speak, reconcentrated in its final prayers. 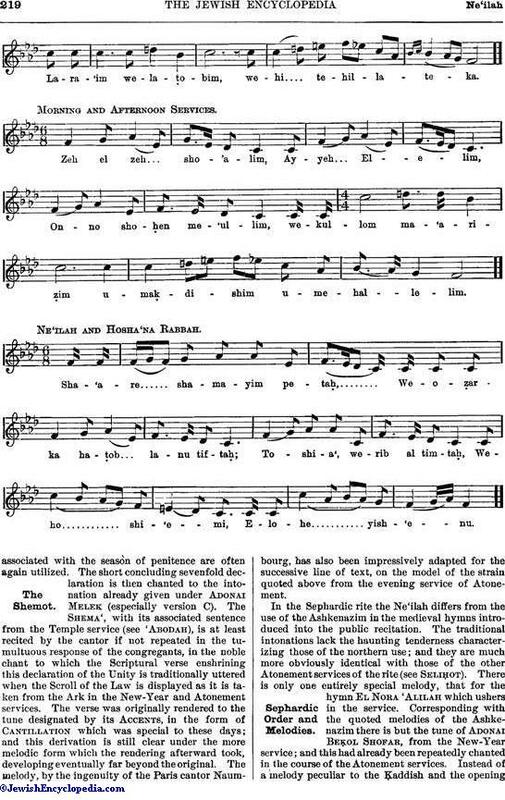 The last of these extracts when chanted in its proper place eleven days later, after the processions on Hosha'na Rabbah, is sung to the Ne'ilah melody, in musical allusion to the cabalistic fancy that that day saw the final registration of the heavenly decrees sealed as the Day of Atonement came to a close. As the service nears its climax, the melodies become severer in tone and broader in expression. This is especially marked in the antiphonal responses of Abinu Malkenu and in the solemn profession of the Shemot. Here, however, as in the earlier portion of the service, the strains characteristically associated with the seasón of penitence are often again utilized. The short concluding sevenfold declaration is then chanted to the intonation already given under Adonai Melek (especially version C). The Shema', with its associated sentence from the Temple service (see 'Abodah), is at least recited by the cantor if not repeated in the tumultuous response of the congregants, in the noble chant to which the Scriptural verse enshrining this declaration of the Unity is traditionally uttered when the Scroll of the Law is displayed as it is taken from the Ark in the New-Year and Atonement services. 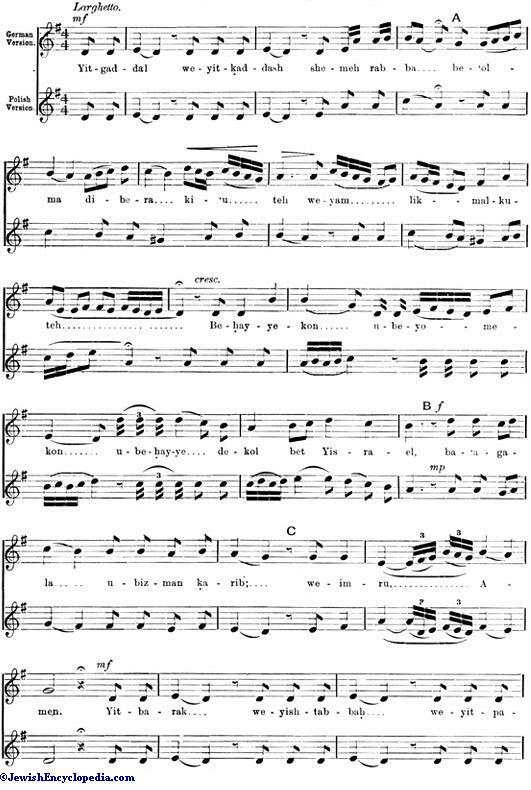 The verse was originally rendered to the tune designated by its Accents, in the form of Cantillation which was special to these days; and this derivation is still clear under the more melodic form which the rendering afterward took, developing eventually far beyond the original. The melody, by the ingenuity of the Paris cantor Naumbourg, has also been impressively adapted for the successive line of text, on the model of the strain quoted above from the evening service of Atonement. In the Sephardic rite the Ne'ilah differs from the use of the Ashkenazim in the medieval hymns introduced into the public recitation. The traditional intonations lack the haunting tenderness characterizing those of the northern use; and they are much more obviously identical with those of the other Atonement services of the rite (see Seliḥot). There is only one entirely special melody, that for the hymn El Nora 'Alilah which ushers in the service. Corresponding with the quoted melodies of the Ashkenazim there is but the tune of Adonai Beḳol Shofar, from the New-Year service; and this had already been repeatedly chanted in the course of the Atonement services. 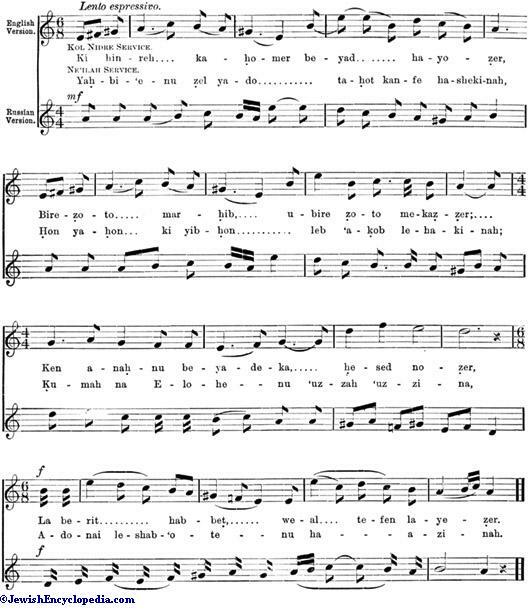 Instead of a melody peculiar to the Ḳaddish and the opening of the "'Amidah," the latter is preceded by the solemn congregational singing of the fragmentary hymn "Adanu," which is likewise prefixed, in its ancient chant, to the Musaf service of Atonement. This is followed by the singing of the penitential reshut (comp. Ḳerobot) by the ḥazzan, usually to the characteristic Morisco melody of Shofeṭ Kol ha-Areẓ. Among the Atonement services in the southern use the Profession of Faith is not so special to the Ne'ilah as in the northern use. In the seliḥot of each of the other four services of the day, officiant and congregation have already reverentially sung the Shema' with its Temple response and the words "The Lord, He is God," the latter in the double form in which it originally occurs in I Kings xviii. 39.In the preceding four services of the day, however, these utterances were associated with a short hymn of Ḳaliric form (comp. Ḳerobot). 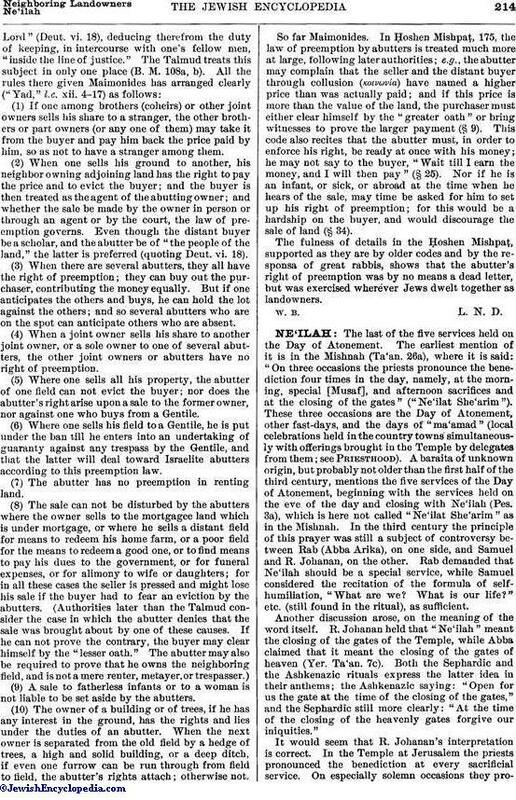 In the Ne'ilah they are proclaimed by themselves in the midst of the closing Ḳaddish, first by the officiant and then by the congregation, the double verse being seven times reiterated, and all being immediately followed by a single complete series of the Shofar calls, instead of the weirdly solitary call which is heard in the northern ritual. 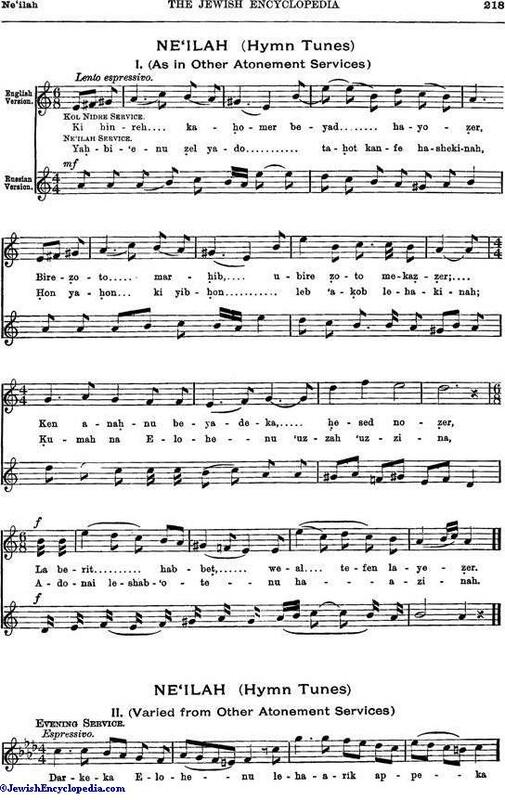 Jessurun, Traditional Tunes, in Book of Prayer of the Spanish and Portuguese Jews, London, 1904.